Suddenly, it was mob week in the news. Once again, the FBI was digging up a field, looking for the remains of former Teamsters boss Jimmy Hoffa. Whitey Bulger's enforcer was on the stand in Boston, admitting to 20 murders and bristling at being called a mass murderer. And Tony Soprano was dead -- not whacked by an underworld rival, but done in at age 51 by his own heart. Soprano, the only Italian-American in the bunch, wasn't even real. He was a fictional character played by actor James Gandolfini in HBO's acclaimed series "The Sopranos." It was Gandolfini who died, while on vacation in Italy, six years after the show that made his character a cultural icon went off the air. Hoffa, a powerful union boss back in a time when unions mattered, was born in coal country and was merely connected (reputedly) to the Detroit mob. Bulger, who is Irish, manipulated the FBI for years by ratting out his Italian mob rivals before going on the lam to sunny California. "There's the reality of organized crime that nobody is in love with, and there's the mythologized version that everyone is in love with," said Ron Kuby, a lawyer who defended the late John Gotti, New York's so-called Teflon don. "We like these outlaws because their lives appear to be so much more genuine than ours, so outside the conventions of society." Here's the myth: Mobsters live by their own, strict moral code. "Family is sacred, they never harm a woman, they never harm a child, the only people they hurt have voluntarily engaged in 'the life'," Kuby said. And then you pull back the curtain and "the reality is ugly and brutal," he added. "The strict moral code also involves cheating on their wives and executing their gay relatives." Part of the appeal is outlaws are dangerous and a little scary -- but not too scary. Certainly not al Qaeda scary, he added. "They're not going to hurt you if you mind your manners." Jerry Capeci covered New York's five Mafia families and chronicled Gotti's rise and fall for the New York Daily News. He now runs a website called Gang Land News. He says we're fascinated by criminals and have been since the shoot 'em-up days of the Old West. Mobsters are the modern-day varmints and cattle rustlers. "John Gotti was the lighting rod that turned New York newspaper readers and TV viewers onto the Mafia in the '80s," he said. Capeci, a native New Yorker and Italian-American, says he treated the mob like any other beat. He got to know the agents, the cops, the prosecutors, the defense attorneys, the victims, even the mobsters themselves. It was a lot like covering schools or city hall, he said, even if the characters were more colorful -- and more ruthless. After all, not many school principals stash guns and piles of money behind walls or stuff bodies into car trunks. America was in search of new, epic heroes after the West was won, agreed Robert Thompson, an expert on media and popular culture who teaches at Syracuse University. Prohibition brought bootleggers and crime bosses like Al Capone. A few decades later, gambling gave us Meyer Lansky and Bugsy Siegel. The 1950s saw the Kefauver hearings, which exposed the existence of the Italian Mafia, also known as La Cosa Nostra. By the 1960s, the time was ripe for Mario Puzo and "The Godfather." Puzo stitched together slices of reality, weaving a tale so colorful that the FBI's wiretaps later captured real mobsters quoting from the book and subsequent movie. 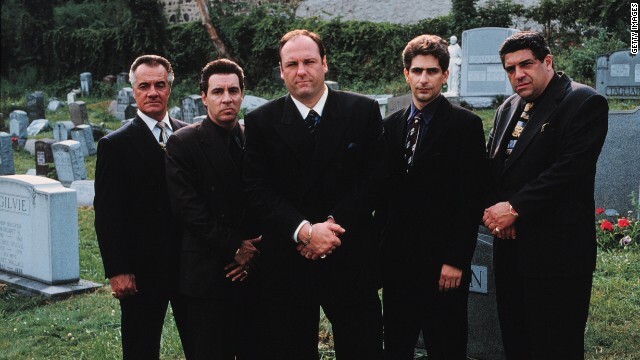 Even the characters on "The Sopranos" recited from "The Godfather." The book, depicting the rise of the fictional Corleone crime family, was published in 1969 and became an instant best-seller. The movie, directed by Francis Ford Coppola and starring Marlon Brando, Al Pacino, Diane Keaton and James Caan, followed in 1972 and was even more popular than the book, Thompson said. To this day, it tops many critics' lists as the best movie ever. "The Godfather II" arrived in theaters in 1974 and it, too, was "spectacular," almost as good as the original, Thompson said. A year later, Hoffa disappeared. The "Godfather" saga had whetted appetites for tales of the underworld. The Hoffa story was huge. Hoffa was last seen outside the Machus Red Fox restaurant in suburban Detroit on July 30, 1975. He'd gone there to meet with reputed Detroit mob enforcer Anthony Giacalone and Anthony Provenzano, a New Jersey Teamsters boss, to settle a beef. They never showed. Hoffa, 62, made a phone call and just vanished. In Hoffa's case, the fascination is all about the mystery. There have been more than a dozen digs for his remains over the years, and plenty of speculation about what happened to him. Maybe he was entombed in concrete under the old Giants Stadium in New Jersey. Maybe he was buried on a Michigan horse farm, or fed to the alligators in Florida. Maybe he ran off to South America with a stripper. The most recent excavation came in response to a tip from an aging Giacalone associate. Tony Zerilli, 85, told agents that Hoffa had been beaten with a shovel and buried alive beneath the concrete slab of a barn, long gone. The tip didn't pan out, but the search did attract a bystander who brought back memories of a famous scene from "The Godfather." A man calling himself "Mr. Ed" showed up at the dig site wearing a horse's head mask and carrying a shovel, apparently to protest the expense of the continuing search for Hoffa's body. There's the reality of organized crime that nobody is in love with, and there's the mythologized version that everyone is in love with. Ten years after Hoffa vanished, Gotti took control of the Gambino crime family and held the city of New York and its tabloids in his sway for nearly a decade. He was a natty dresser and loved playing to the television cameras as he was acquitted three times at high-profile trials. He became known as the Teflon don and it infuriated the feds. The FBI finally flipped underboss Salvatore "Sammy the Bull" Gravano as a star witness against Gotti, and The Bull testified in 1992 about five gangland executions. Gotti received a life sentence, plus fines and a $50 "surcharge." Gotti's attorney, Kuby, said he will never forget what Gotti said as he took off his expensive silk tie back in the holding cell: "Wow, that $50 surcharge. They really know how to hurt a guy." Gotti died in prison in 2002 after a battle with throat cancer. To the end, he remained "a stand-up guy" -- high praise in the mob world where "rats" like Gravano are reviled. The feds turned their attention to Gotti's son, "Junior," who, according to newspaperman Capeci, "was a household figure for several years." The feds tried four times in five years to convict him of mob-related charges but failed. Gotti claimed he was "retired" from the mob, and the feds finally threw in the towel in January 2010, saying in court papers: "In light of all the circumstances, the government has decided not to proceed with the prosecution against John A. Gotti." "He was and he's still in the news," Capeci said. "He has commissioned a movie about him and his father." There have been other mob movies over the years. "Goodfellas," starring Ray Liotta, Robert De Niro and Joe Pesci, told the story of the late mob informant Henry Hill. Actress Lorraine Bracco made a career out of mob dramas, playing Henry Hill's wife in "Goodfellas" and Tony Soprano's shrink in "The Sopranos." Jimmy Hoffa, Whitey Bulger and Tony Soprano are old world characters whose sagas long ago took on lives of their own. They were bad guys, perhaps, but they weren't all bad. They lived by their own code. It's just business. Fuhgeddaboudit. While Hoffa has become more famous for being gone than for anything he did while he was here, Bulger was embraced for a while as a sort of Robin Hood in Boston's Southie neighborhood. The myth was spun, it later turned out, by his corrupt FBI handler. As his trial began in Boston, Bulger's attorney admitted he was many bad things -- a bookie, a loan shark, a thug -- but denied that he'd ever been an FBI informant or that he killed two women who are among his 19 named victims. Such things went against the code. For Bulger, 1999 was the beginning of the end. That's when a federal grand jury handed up the indictment he's now being tried for. "The Sopranos" also began that year on HBO, and Tony Soprano was a man for his time. He wasn't real, but he was realistic as a Jersey guy in "waste management" who had panic attacks and bouts of depression and loved his kids.
" 'The Sopranos' is all about a guy at the turn of the century who wants to be Don Corleone, but he's got this horrible feeling that everybody perceives him as Homer Simpson," pop culture expert Thompson said. "He's beating up this guy and he's talking about how 'I heard you didn't respect me.' He wants to be the classic mobster, but he's got these constant domestic issues with his mother, with his wife, with his shrink. He's leading this schlub life. That's what that show was all about: It updated the American urban myth." He cited a favorite Tony Soprano quote: "It's good to be in something from the ground floor. I came too late for that and I know. But lately, I'm getting the feeling that I came in at the end. The best is over." Sometimes it is difficult to separate fact from fiction. It turns out that Tony Soprano wasn't the only good fella to visit a shrink because of the stress in his life. Bulger has spent some time on the couch, too. The feds who were looking for Hoffa might have come up empty-handed. But this week in Queens, other FBI agents hit pay dirt in somebody's basement, Capeci reports. They unearthed human remains. "Officials believe the victim was killed by a Bonanno family gangster as a favor to Jimmy 'The Gent' Burke, the mastermind of a daring $6 million airlines heist who died in prison in 1996," he wrote on Gang Land. Capeci also had a tip for members of the Lucchese family, now that budget cuts have thinned the ranks of the FBI mob watchers some 60% since 2008: "Memo to Big Frank, Bowat and Stevie Wonder: Relax: That woman you saw the other day who looked out of place probably wasn't an FBI agent. Neither was the guy who eyeballed you near your house. And don't worry about that suspicious-looking car that pulled up alongside you last week -- or fret about using your cell phone, for that matter. The FBI now has only three agents assigned to cover the entire Lucchese crime family." You can't make this stuff up. There is no beginning or end to these larger-than-life stories, only lots and lots of middle. So, people keep coming back for more. "What can I say? The beat goes on," Capeci said. This concept certainly wasn't lost on the producers of "The Sopranos." Remember the Journey song playing on the jukebox as Tony and his family (with a small "f") gathered at a diner in the finale? Remember the lyrics of "Don't Stop Believin' "?